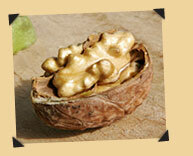 Inside that hard outer shell of a walnut you’ll find a wide variety of substances that nourish and promote good health. Walnut shells are composed of two halves. The space between the two halves is called the shell seal. Shell seal strength varies by variety, but most are very tightly sealed to protect the nut from moisture and pests. Once you break open a walnut you’ll discover a hard fibrous membrane lining the inside of the shell and running between the two halves of the nut. You’ll also notice a thin skin around the meat, called the pellicle, which contains tannins that are associated with promoting heart health. After and orchard is planted, it takes approximately six to eight years until its first yield. Constant attention is given to each tree every step of the way – from pruning, spraying and fertilizing to irrigation – to ensure a healthy orchard. Once a walnut tree has been planted and stabilized, it will continue to bear fine quality fruit for as long as a century. In late August, boughs of California walnut trees hang heavy with walnuts, protected by nature in thick green hulls. The harvest begins in late August when the protective green hulls split, signaling that the nuts are ready to be removed from the trees. Harvesting methods used depend on the size of the orchard and the equipment and crew available to the grower. The harvest season usually continues into early November. After hulling and washing, the nuts are transferred from the mechanical harvester into a hopper where they are mechanically dehydrated (air-dried) to the desirable 8% moisture level. This prevents deterioration of the nut and protects its quality during storage. Mechanical dehydration—quick, thorough and scientifically controlled—represents a major improvement over the sun-drying method formerly used. 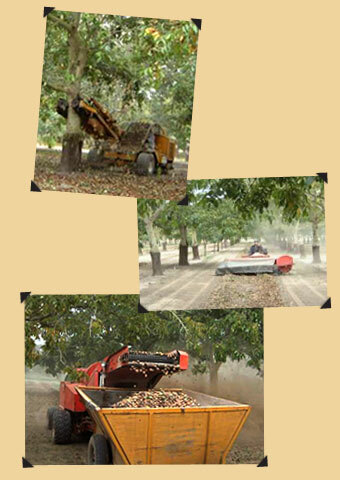 The California walnut industry sets a world standard for providing the food industry with a product of the highest quality. Under rules of a federal marketing order, all lots are inspected and certified by the Dried Fruit and Tree Nut Association of California (DFA) to meet strictest specifications. In-shell walnuts undergo continuous sampling during packing to assure that all specifications are met. Once shelled, walnut kernels are physically inspected to ensure an end-product that is clean, well-dried, and of specified color as determined in comparison to the official walnut color chart. Tolerances for total and special defects are specified for each grade. Laboratory tests, both chemical and microbiological, are also conducted to meet strict regulatory agency requirements. Shelled walnuts should be kept in an odor free as well as ammonia free environment away from excessive heat, moisture, light and air to ensure maximum shelf life. To maintain optimum freshness, shelled walnut kernels should be kept in refrigerated storage areas at 1-3.3 degrees C or 32-38 degrees F, and at 55-65% relative humidity. California walnuts are rich in food value. They are a good source of several vitamins including thiamin, vitamin B6, and folacin. 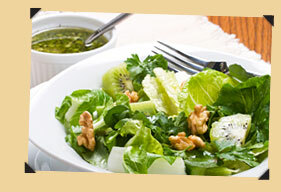 In addition, walnuts are a good source of the minerals iron, zinc, copper, magnesium, phosphorus, and potassium. They are naturally low in sodium and contribute substantial amounts of dietary fiber. Walnuts also contain about 14.1 grams of protein per 100 grams of edible portion. Most of that protein is digestible. This makes walnuts extremely valuable to food scientists working to combine ingredients which yield the complete protein quotient. 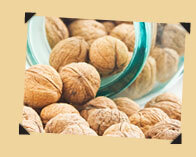 Walnuts contain no cholesterol and are high in unsaturated fats. Of the total polyunsaturated fat in walnuts (70%) 58% is linoleic acid and 12% is linolenic acid. Both of these fatty acids are essential for good health. 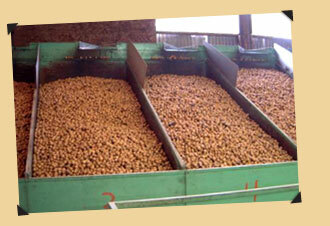 Under proper storage conditions, these food values will not deteriorate in walnuts. Walnuts have been recognized as the oldest tree food known to man, dating back to 7000 B.C. Considered food for the gods in the early days of Rome, walnuts were named “Juglans Regia” in honor of Jupiter. Today, they are commonly called “English” walnuts, in reference to the English merchant marines whose ships once transported to the product for trade to ports around the world. California, with its mild climate and deep fertile soils, provides ideal growing conditions for the total U.S commercial crop and accounting for 2/3 of the world’s trade. The Franciscan Fathers are credited with bringing walnuts to California from Spain or Mexico. 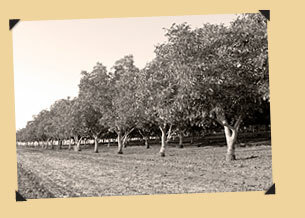 The first commercial planting began in 1867 when Joseph Sexton, an orchardist and nurseryman in the Santa Barbara County town of Goleta, planted English walnuts. For several years, walnuts were predominately planted in the southern areas of California, accounting for 65% of all bearing acreage. Some 70 years after Sexton’s first planting, the center of California’s walnut production moved northward to the Stockton area in one of the most dramatic horticultural moves in history. Better growing areas, improved irrigation, and better pest control methods in the north resulted in greater yields which gradually increase each year.